Rubix Project Review - Dangerous Scam Exposed With Proofs! 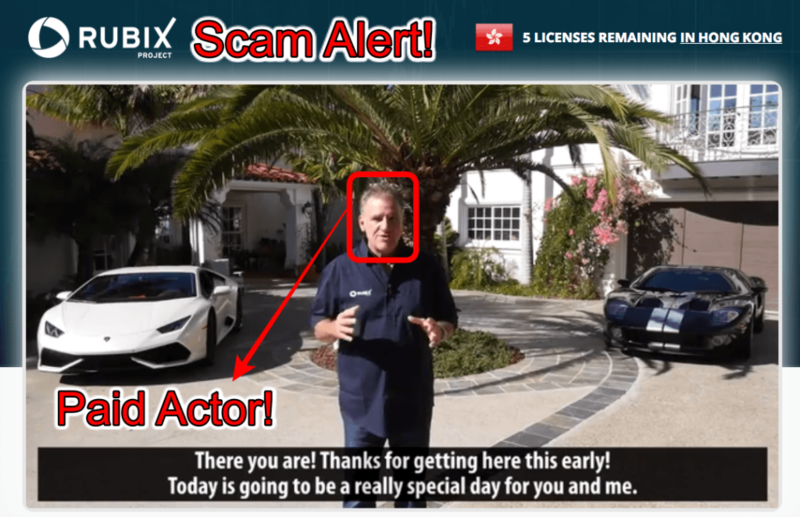 Rubix Project Review – Dangerous Scam Exposed With Proofs! The Binary Options Industry is known for introducing new software almost daily. We try to review each of the new software, which arrives at the Binary Options trading arena. Today, we review the Rubix Project software. It’s said that everything is fair in love and war. We say add the name of Rubix Project software to this idiom too. It did not take us much time to identify the real motive behind the Rubix Project ad campaign. The video itself would suffice for any serious and experienced trader to pronounce it as a full blown SCAM. If you are new to Binary Options Trading and have not been able to decipher the lies, don’t worry. The chances are that you were thoroughly impressed by all the pomp and show in the video, yet thought to seek an opinion on it. Trust us, your visiting our blog for getting an ‘opinion’ on the Rubix Project software would prove to be your most intelligent decisions recently. Read our full Rubix Project review and be sure that you are not losing $250 or more, forget about earning more than $10,000 in daily profits. We are introduced to the awesomeness of the Rubix Project by its founder and CEO Mr. Brian Morgan. Multi-millionaires are not a very common sight in real-life, not so in Binary Options auto-trading software sales videos, where every other person introduced is either an ‘anonymous’ millionaire or is one in the making. Mr. Morgan flaunts his Lamborghini and other assets so much so that all the fake setup would surely impress a naïve trader. Mr. Morgan plays the sympathy card and lets everyone know of his life’s troubles. Mr. Morgan used to be a Professor of Mathematics, and that job did not suffice. It’s strange that why all professors and people in the education field have not left their jobs and moved on to greener pastures if such jobs are not adequate. His divorce with his wife, a suicide attempt and magically coming up with the Rubix software and what not! Mr. Morgan has done it all. Mr. Morgan hired the best brains in the industry ranging from Wall Street Analysts and Stanford Alumnus to get the Rubix Project software made. How he managed to do all this when he was supposedly broke, we just don’t know. The software is said to have made over $86 million for him over the years. He also claimed that the software had made over $40 million in profits in 2016 alone. 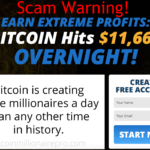 The software is allegedly capable of making astounding profits of over $10,000 daily! Why is the Rubix Project a SCAM? As any experienced person who has even a little knack in trading would have sensed by now, that the Rubix Project is a scam. The daily profits that the software promises to generate have been deliberately hyped up. The hype is so bizarre that it has touched the stupidity level. Who can imagine raking in over a Grand on a daily basis, with just a one-time investment of $250? Another lie served shamelessly is that the software has not lost a single trade in over 16 months. The software is said to open only winning trades; such is the sophistication of the software. Let us tell you, it’s a big lie we can see right through. The Rubix Project scam website features two different videos. When someone tries to leave the page due to any reason or refreshes it, the second video starts with a fake ‘live trading’ session. Mr. Morgan demonstrates how the trading can be performed in manual as well as in auto-pilot mode. He shows ‘Live’ how the manual mode works and how the profits are thin. Mr. Morgan moves on to demo the auto-pilot mode, and this is where the scam really puts its ugly head up. 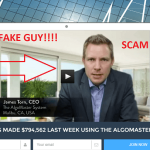 He demonstrates the Rubix Project scam software opening 60 seconds trades and winning all of them. In no time, his trading account swells to show profits of over $10,000! This he says would continue for the rest of our life, what a joke! This deceitful plan of scammers behind Rubix Project scam is really a no-brainer to crack. It’s well known that any withdrawals from the trading accounts into the bank accounts takes a minimum of 2-3 working days to process. There are many formalities and procedures in place ranging from scrutiny and security compliance. What we see in the case of Mr. Morgan is that no sooner than his fake software accumulates over $10,000; he takes out his Lamborghini and drives off for his bank to withdraw it! And guess what, he shows off the withdrawn sum too. Our head spins when we think over the foolishness of the scammers to have shown this part in the video. Rubix Project – We have seen it before! The Rubix Project software interface looked eerily familiar to us when we first saw it. It is just a re-launch of older scams like the Sowelstace Financial and Royce Code, which we reviewed in great detail on our blog. The software does not give any choice of broker selection or to set the daily loss limit etc. Teaming up with the broker of their choice shows a nexus between them. Anyways, it is something which is already out in the open. The Rubix Project scam video is hilarious and in a way cute too. It is like a homecoming video of the scam artists. The so-called analysts you see are actors who have been exposed big-time. The bald analyst was seen as the CEO and founder of the Sowelstace Financial scam software in which he was rightly identified by the lady as a ‘Bad Santa.’ The other two analysts Brian and David were last seen in some other scams too. Pity, the self-made multi-millionaires are down to the role of analysts in this case. It looks like their own software’s auto-pilot modes went rogue. Verdict – Rubix Project Is 100% Scam. Avoid This Scam! Why To Join Scams? 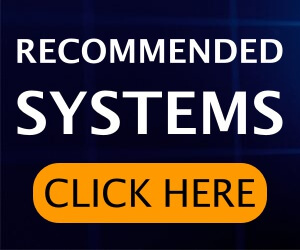 Join Best Binary Options Robot With Verified Results! Check My Experience With BinBot Pro Software in this Bin Bot Pro Review. 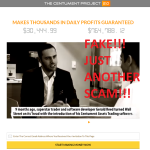 The Rubix Project is a cheap scam draped in the garb of a costly sales video. We hope the various facts and proofs we have put forward would be enough to guide you through your next step? Do not subscribe or share your personal information. 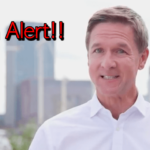 This is a scam you should definitely give a cold shoulder to! I hope this Rubix Project review helped you in taking right decision. OneTouch Trade Review – Another Scam System? Yes! 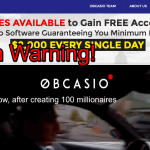 Obcasio Review – Scam Software Exposed! Avoid It!